We'll admit it...we get a little bit giddy for celebrating. Birthday milestones, new babies, elopements, backyard reunions, weddings... we love every single one, and we love hearing all your details for the big day. Perfect Salt welcomes all couples and families (however you define family) to share your celebration planning ideas with us...let's get creating! PERFECT TIMING: We have hundreds of designs ready to be customized, meaning we can create a custom design that fits your timeline. PERFECT SIZE: Whether you're eloping with just a few friends, or having a bash for hundreds, we can print just the right amount for your event. PERFECT PRICE: With so many options available for printing, we can create beautiful pieces that match your event...and your budget! all projects require 50% downpayment to commence design process, with balance due before printing or delivery. payment plans available! As an official Envelopments dealer, we have access to all the latest colors, designs and paper products, allowing us to mix, match and create pieces that perfectly match your event and style. Let the celebration start the second your guest opens your invite or announcement! At Perfect Salt Studio, all of our invitation and announcement designs are professionally printed on luxe, heavyweight cardstock, meaning they feel just as great as they look. We offer 100% recycled options for all our invitation and announcement designs, and streamline our shipping and business practices to be as environmentally friendly as possible. 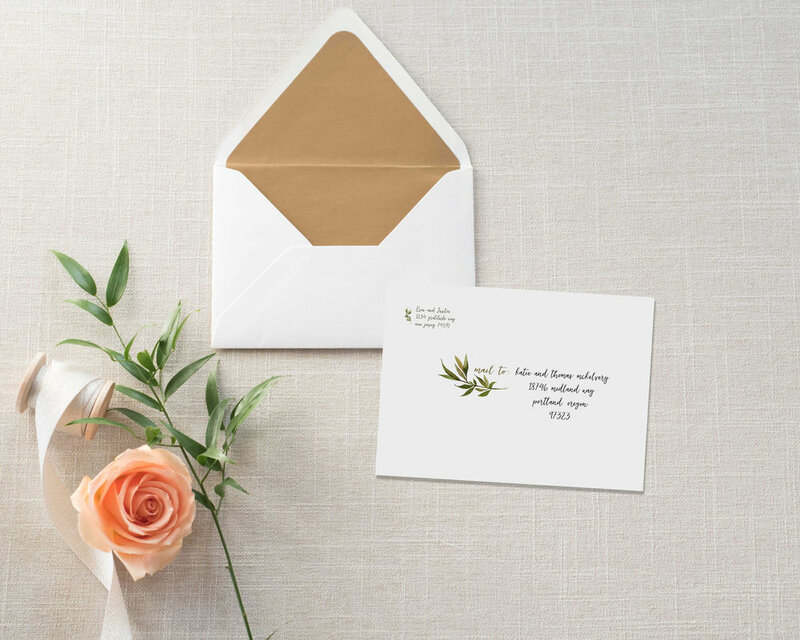 From custom colors and patterns, to beautiful liners, specialty address labels and custom envelope printing, there are endless ways to style your design to match your event. Custom envelope printing (see photo above for example) = starting at $0.50/ea. Custom address labels = starting at $0.25/ea. Custom envelope liners = starting at $0.20/ea. Envelope colors are available in over 50 specialty shades! Ready to make something pretty? Click here to contact us!